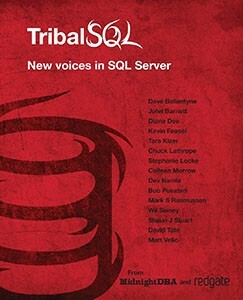 MidnightDBA and Redgate partnered to produce a book filled with community – tribal – knowledge on SQL Server. The resulting book is a series of chapters on lessons learned, perhaps the hard way, which you won’t find in traditional training or technical guidance material. A DBA’s core responsibilities are constant. A DBA must have the hard skills necessary to maintain and enforce security mechanisms on the data, prepare effectively for disaster recovery, ensure the performance and availability of all the databases in their care. The resulting book, Tribal SQL, is a reflection of how a DBA’s core and long-standing responsibilities and what it means to be a DBA in today’s businesses.